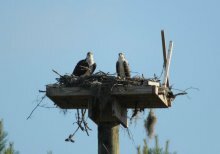 Osprey chicks should be ready to fly and leave the nest, called “fledging”, about ten weeks after hatching. The chicks at Legare Farms were hatched at the beginning of May. Sure enough, by mid July they were full size and hopping around the nest. One was more active than the other and was presumably the dominant chick. During earlier visits we had also noticed that one was more aggressive about feeding than the other. A few years ago we were lucky enough to see three chicks fledging on an almost daily basis. There were three in that nest and ten weeks in they began jumping around and flapping their wings, hopping three to four feet in the air. 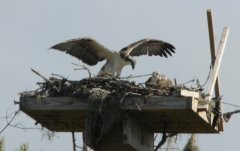 At one point, while there was a moderate breeze one jumped up, got blown off the nest and started falling to the ground. The chick decided it had to actually fly and began flapping its wings. It got enough lift to cruise to the ground where it landed looking bewildered for about 10 minutes until the parents returned. The chick finally started hopping around again flapping its wings and then took off and circled back up to the nest for a wobbly landing, almost certainly its first flight. 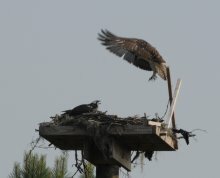 The pictures here show the young chicks at Legare taking off. Probably not the larger chicks first flight as it seemed pretty confident. The other chick was not as strong on take off. Landing was equally tenuous, almost a controlled crash. The chicks were not nearly as elegant as the full grown birds who would swoop in under the nest and come up into a “stall” to land softly on the perch.